Heads are surprisingly un-fuzzy today at EGD given that yesterday was our Christmas party which, for some of us (but not me), ended way after midnight. 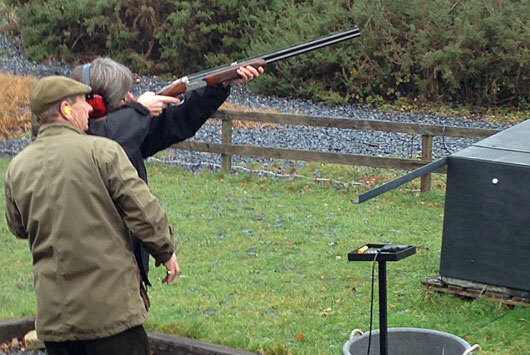 While the evening ended in a local pub which served very good food and very alcoholic alcohol, the afternoon started with the first ever EGD Clay Pigeon Shooting Championships, held at the National Clay Pigeon Shooting Centre in Bisley, which is about ten miles from our office in Sunningdale. Only one of us, Michael King (known as ‘Queenie’ to all) has ever shot before and the thought of the rest of us having access to guns should be a cause for great concern. Given the lack of experience, we actually all did quite well and a significant proportion of the ‘pigeons’ were blown to kingdom come during flight. Queenie was so good that he was told that once he’d hit the clay with his first shot, he should then shoot the largest remaining piece of it with his second shot, which he managed to do repeatedly. Shara started a round by missing several before hitting about six in a row. What changed? “I got cross” she said. Colleagues, consultants, clients – be afraid of this woman…do not ever make her cross. The afternoon ended with a head-to-head shootout between the teams, with the final shootout between Queenie and Matt. As we knew how good he was, those of us on Queenie’s team relaxed knowing victory was soon to be ours. How wrong – like some gunslinger from the American west, Matt smoked him 2-1. “You’ve got to dig deep.” was all Wy-matt Earp had to say as the smoke cleared as we moved off for dinner. Above: Shara on the rampage.